HCMC is the first locality in Vietnam applying one door mechanism which has reduced time to do administrative procedures of projects in export processing zones (EPZs) and industrial parks (IPs), accounting account for one third of that outside the zones and parks, according to statistics by the Ministry of Justice. In 1991, the 7th National Congress of the Communist Party of Vietnam passed the strategy on socioeconomic stabilization and development by 2000 with the policy of developing all economic sectors and broadening forms of joint venture and cooperation with foreign partners to boost export. That was a priority direction to develop and modernize consumer goods industries. The policy of the Government, the council of ministers at that time, was to establish export processing zones to materialize the direction and HCMC was chosen to pilot the model. Before being assigned by the central government to pilot EPZ, HCMC leaders had started studying foreign economic development models including successfully built EPZs in some nations and territories. Recalling the first steps in the path of implementing the new model to lure foreign investors, 85 years old Nguyen Long Trao, former office chief of HCMC Party Committee and former deputy director of Saigon EPZ (Sepzone) said that one of difficulties was no legal document stipulating rights and duties of foreign investors in EPZs. “At that time, there was Foreign Investment Law but it had yet to meet legal requirements in building EPZs. Therefore, we must build regulations and submit to the Government to issue,” recalled Mr. Trao. Mr. Trao decided to travel to Taiwan (China) to learn experience. To save money, he went with the delegation of Cau Tre Food Processing Factory. Arriving in the territory alone without any recommendation, he could not access EPZs. Suddenly remembering a Taiwanese doctor who used to work in Vietnam, Mr. Tao contacted him. The kind hearted man let him stay in his house and contacted Taichung EPZ to get copies of documents about the zone for him, saying that was a present for Mr. Trao’s kindness to him in the past. With the documents, Mr. Trao returned home, together with attorneys compiled a set of regulations on EPZs and submitted to the Prime Minister for approval. Waiting for a certain period of time without reply, he arrived in Hanoi to meet Prime Minister Vo Van Kiet. On the following day, the PM read documents and approved Decree 322-HĐBT to issue EPZ regulations, which is the first legal key for establishing EPZs nationwide on October 18, 1991. On November 25, 1991, Tan Thuan Export Processing Zone, the first one of the country, was established according to Decision 394/CT by the Council of Ministers. The zone opened a wide door to lure Taiwanese investors to Vietnam and create a foreign investment wave in HCMC and adjacent areas. The success of Tan Thuan EPZ and Linh Trung EPZ afterwards has opened the way for HCMC to continue forming many other EPZs. From that success, the city has developed industrial parks in the outskirts of the city, creating a model to develop industrial parks in provinces and cities nationwide. So far, HCMC has built 17 export processing zones and industrial parks which have conducted administrative reform to create advantageous conditions for investors and attract capital to industrial production field. The administrative reform model has been applied for EPZs, economic zones and hi-tech parks in provinces and cities nationwide. 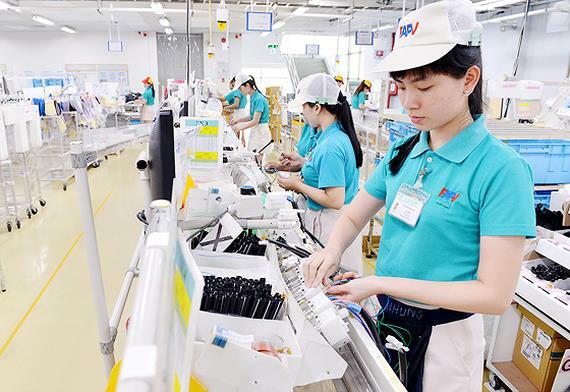 Mr. Phan Chanh Duong, former director general of Tan Thuan EPZ Joint Venture Company, said that EPZs have provided jobs and skill training for workers with modern machines and professional production process from foreign investors. They have brought Vietnam foreign currencies from rent, electricity and water use payment. The biggest benefit is that products of export companies are labeled ‘made in Vietnam’, showing that although companies are foreign but their goods are made in Vietnam according to international standards and sold worldwide.